Close to half-a-million people joined in the world’s largest garden wildlife survey counting more than eight million birds during the 38th RSPB Big Garden Birdwatch, witnessing some exciting and unusual visitors. The event held over the last weekend in January revealed an explosion in the number of recorded sightings of waxwings. These attractive looking birds flock to UK gardens in winter once every 7-8 years when the berry crop fails in their native Scandinavia. Known as an ‘irruption’, results showed that waxwings were seen in around 11 times more gardens in 2017 compared to the last couple of years, with sightings as far west as Wales and Northern Ireland. Dr Daniel Hayhow, RSPB Conservation Scientists, said: “The sight of a robin or blackbird perched on the garden fence is often one of the first experiences we have with nature. So to have over half-a-million people taking part and counting a bumper eight million birds across one weekend is amazing. Using the information from the weekend we’ll be able to create a snapshot of how our garden birds are doing. There was also good news for robins, with the average number seen visiting gardens at its highest level since 1986, helping it climb two places to number seven, its joint highest-ever position in the Big Garden Birdwatch rankings. Blackbird was another climber, moving to number three and becoming the UK’s most widespread garden bird after being spotted in more than 93% of UK gardens. This year’s results also pointed to the positive effects that wildlife friendly gardens are having on bird behaviours. Recorded sightings increased for sixteen of the top 20 Big Garden Birdwatch birds between 2016 and 2017 showing how gardens are becoming an invaluable resource for our most common British garden birds. The nation’s school children noticed a similar pattern when taking part in the RSPB Big Schools Birdwatch. The UK-wide survey of birds in schools saw over 73,000 school children spend an hour in nature counting birds. Blackbird remained the most common playground visitor for the ninth year in succession with over 88% schools spotting at least one. The top three was rounded off by starling and woodpigeon. Big Garden Birdwatch and Big Schools’ Birdwatch are a part of the RSPB Giving Nature a Home campaign, aimed at tackling the house crisis facing the UK’s threatened wildlife. The charity is asking people to provide a place for wildlife in their gardens out outdoor spaces – whether it’s putting up a nest box for birds, creating a pond for frogs or building a home for hedgehogs. Research published in the British Trust for Ornithology (BTO) journal Bird Study, looked at the breeding populations of Herring Gull, Great Black-backed Gull and Lesser Black-backed Gull on the Hebridean island of Canna, and the relationship between them and the fall in the quantity of fish landed in the nearby harbour of Mallaig. Between 1985-2000, an annual average of 13,726 tonnes of fish was landed there, but between 2007-2014, this fell to 4,456 tonnes. The number of breeding pairs of Herring Gulls peaked at 1,525 in 1988, Great Black-backed Gulls reached 90 pairs around the same time and the highest number of Lesser Black-backed Gulls was 63 pairs. But at the last count, breeding gulls on Canna were 95 pairs of Herring Gulls, 18 pairs of Great Black-backed Gulls and 13 pairs of Lesser Black-backed Gulls. This population decline has also been associated with low breeding success, with only a small number of chicks successfully fledging in more recent years. TV naturalist Chris Packham has joined forces with environmental campaigner Dr Mark Avery to launch an online campaign to encourage people to sign an e-petition to ban driven grouse shooting. Campaigners say that grouse shooting for 'sport' depends on intensive habitat management which increases flood risk and greenhouse gas emissions, relies on killing Foxes, Stoats, Mountain Hares in large numbers and often leads to the deliberate illegal killing of protected birds of prey including Hen Harriers. 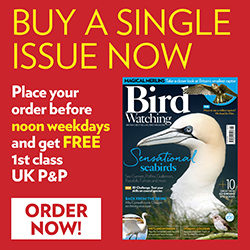 Chris told Bird Watching magazine: “Like many other birders I grew up thinking that the persecution of our birds of prey would become a thing of the past in my lifetime. But sadly that is not the case, indeed in recent times it’s actually begun to get worse. Chris added that attempts to work with shooting groups to reach a compromise had failed. The RSPB has fitted tracking devices to 19 Whinchats at their Geltsdale reserve in an attempt to find out why these migrants are in serious decline. Whinchats migrate from Africa every year to breed in the uplands of the UK, but since the mid-1990s the number of birds arriving here has halved. RSPB conservation scientist Malcolm Burgess and three volunteers located and tagged the birds over the summer, and are hoping to use the information gathered to better map the species movements and discover where they overwinter. A new website launched by Blue Sky Wildlife offers birdwatching and wildlife enthusiasts a new way to search for worldwide ecotourism and wildlife tours. Thirty-four established and award winning wildlife tour operators and companies are already listed on the site, covering 24 countries, which is anticipated to grow to more than 100 within the next six months. The new website offers the flexibility to search for all kinds of holiday experiences, taking into account conservation, families, photography and trekking. Independent birders who prefer to work through their own personal species list can now search for the right tour operator by bird species name, directly from the keyword search area. The birdwatching holidays and experiences include everything from photography workshops to a boat trip off the coast of Kaikoura admiring magnificent Wandering Albatross in New Zealand, and from a variety of rainforest adventures in Peru, Colombia or Jamaica to a 30-day mega bird watching tour in Uganda. “We were inspired to launch this new website as we felt there was nothing like this for the birdwatching and wildlife industry, while seeking to elevate conservation as a selection criteria for birders without compromising on their overall wildlife experience,” said Chris Larsen, of Blue Sky Wildlife. Blue Sky Wildlife, in association with Birdfair founder Tim Appleton MBE, has aimed to get the eco-tourism balance just right, committing to sustainable ecotourism and conservation. It is also recognised as a Birdlife Species Champion supporting the Birdlife International Preventing Extinctions programme.